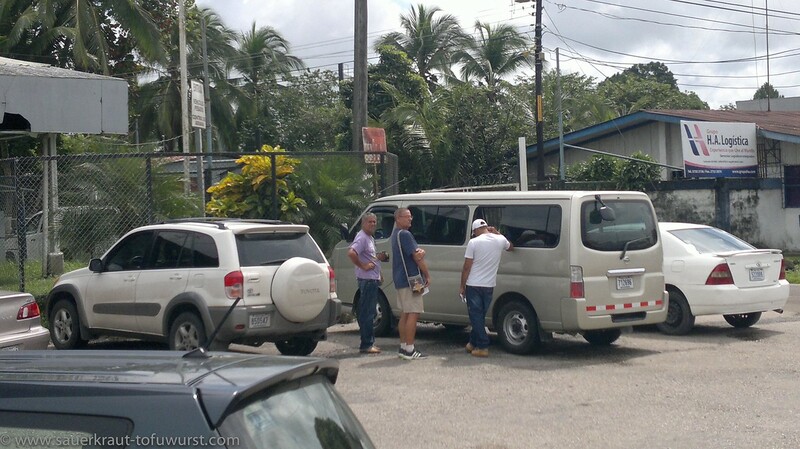 We arrived at the border in Paso Canoas on the September 7th 2015 around 8AM and left more than seven hours later! It was our longest border crossing ever in the past two years. Here is what happened. We left our hotel in Ciudad Neily and rode the 18km to the border. The Costa Rica immigration is easy to find once you are familiar with Central American border crossings (they follow a similar pattern). 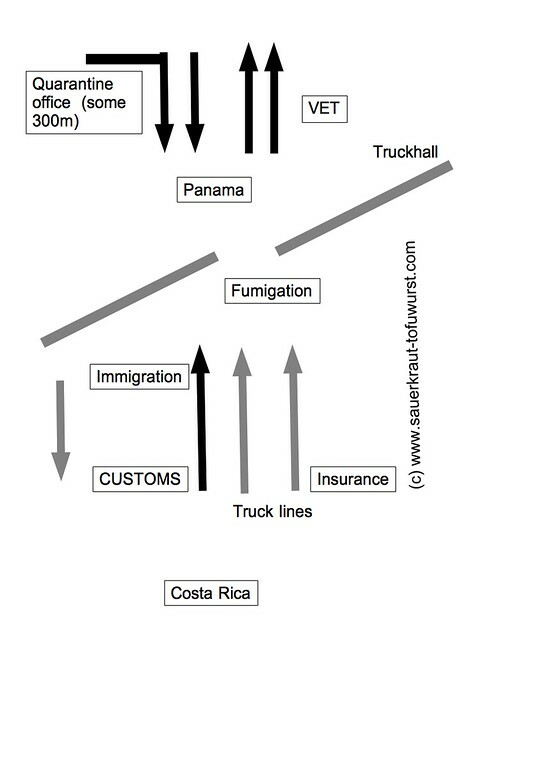 Immigration and customs are on your left a few meters before you see the big truck hall on the Costa Rica side. Unfortunately there was a huge load of school kids from Honduras on their way to Panama, I would say all together some 50-60 people and there was only one counter available to handle the rush. I organized me the exit forms and filled them while waiting. Some 30 minutes later it was my turn and then the guy told me that I first need to pay the 7USD exit fee. It took me a while to find the bus where this exit fee can be paid. The lady charged me 1USD extra. I am not sure for what but she had our passports and insisted on the extra 2USD. Obviously some additional service fee. This was the bus to pay the exit fee - figure that! I paid the fee and made it back to the counter. I was able to get both passports stamped even though Skippy stayed at the bike. The customs were very easy. 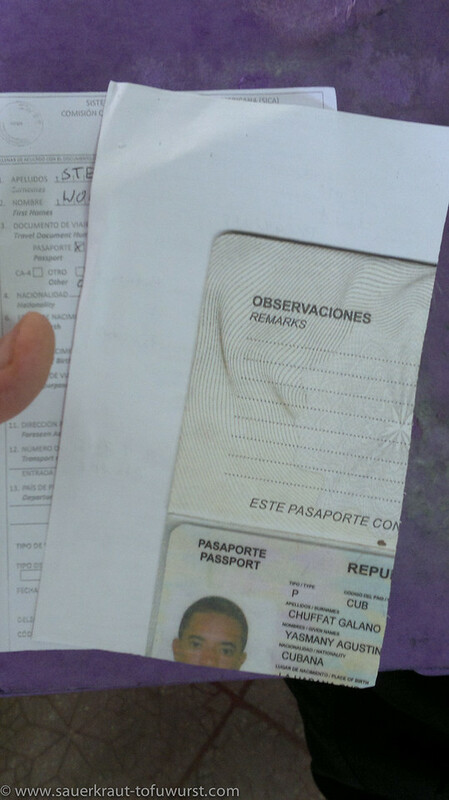 I filled in the form and the guy asked me several times whether I am sure I do not want to come back to Costa Rica. Yes, I am sure. No additional costs here. Without this enormous cue because of the kids, this would have been done in 30 minutes total. I wanted to change our CR money at the Bank of Costa Rica in the no-mans land but the cue there was already pretty long and the sidecar with the kids and Skippy parked in straight sun, so a no-go here. 2. Go to immigration, show the insurance paper and get your passport stamped. The officer will take a picture of your face with a tiny camera (==> personal presence is mandatory). 3. Go to customs and give them copies of title, insurance, passport and the passport itself. Wait for 25 minutes and then get your papers. 4. I went back to immigration (cannot remember if the guy did something again to my passport or not) and then Skippy got her passport stamped and her picture taken. Here is where the mess started with our puppies. If you travel without pets you are almost done. 5. Get the stamp on the back side of the customs paper signed by a appropriate free-running-and-hard-to-spot customs officer. 6. 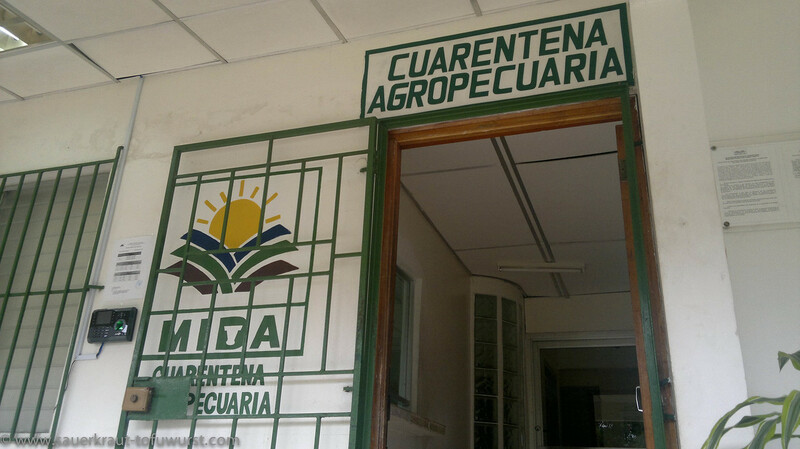 Pay 1USD for fumigation and drive NOT forward through the hall (I mean read the sign, it clearly says there no persons allowed) because it is an automatic spray system. Of course if you like disinfecting yourself, this might be your chance. 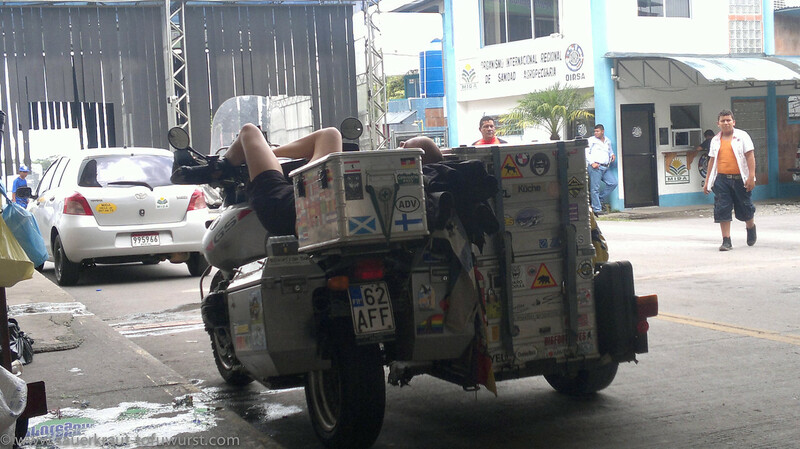 Get the bike fumigated and welcome to Panama. You will see many street dogs crossing the border. 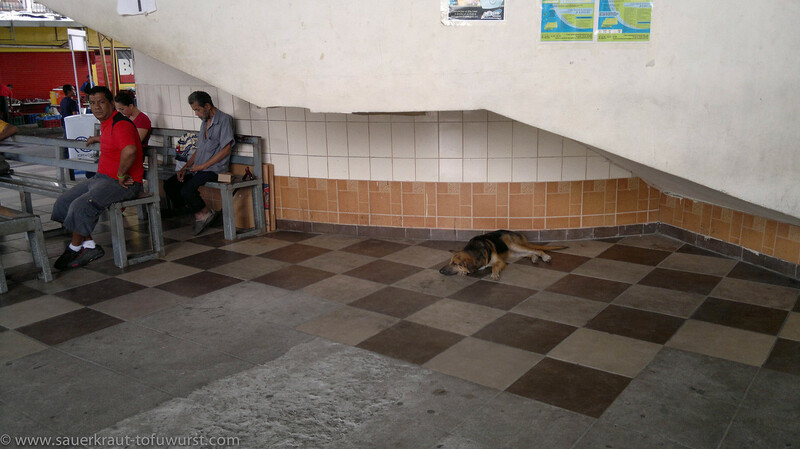 One of the street dogs having a nap. Here is the chapter for all pet travelers. The agriculture guy at the border was going all ape when he saw that we have dogs. He said it will cost about 430USD and if we are not willing to pay, go back to Costa Rica pointing friendly north where we came from. We took the risk and did not inform upfront by email that we would come. Thus THE vet was not waiting for us. We waited about 1.5 hours for the vet to come but he did not. I walked then with the agriculture officer and our dogs to the place called "cuarentena agropecuaria" which is about 300m inside Panama and then the first street left up the hill. There are quite a few trucks there. There, this local vet (not THE one we waited for) gave our dogs a short examination and then the waiting started. It looked to me that the people in the office did this paperwork for the first time in their life. The lady called the vet a few times to ask this and that. I went here to get transit papers done for the dogs. 12USD lighter as well as one major rain shower and two hours later we were done. In the end I got two transit permits (6USD each). One for our girls with Finnish passport and one for Peto (as he is born in Costa Rica). Actually I am not sure what papers I got, because they told me that they will send some papers by email within the next two days (which never came). Many street dogs were crossing the border. Skippy took a nap at the border. After that I went back to the bike and THE earlier called vet waited there patiently with Skippy for about one hour already. I went with him and he filled in some other paper which costed me 130USD per dog - the notorious home quarantine thing. Since the banks were already closed, I paid the money cash to him and he promised to send me the receipt via email (which he did). Actually the vet wanted to have a copy of the paper which he wrote but since there was an electricity cut the copy machines were out. Almost done. Obviously the vet did not know that the agriculture guy had some own agenda. So some more papers to be filled and an additional 10USD examination fee per dog to be paid. Finally I could proceed with the last signature in the bike papers and the fumigation. Whereas many street dogs were crossing the border (I might have mentioned that earlier). About 800m after the border there was a filling station and all five of us were very hungry. We had first a break at the filling station a few hundreds meter later. We were really hungry and blood sugar was rock bottom. A short while later was the usual police check-point and the guys were all very happy with our paperwork especially for the dogs. We paid in total 464USD (2*8USD for exit fee, 3*130USD per dog, 2*6USD for transit license, 3*10USD for examination, 15USD for bike insurance, 1 USD for fumigation, 1USD for copies). In hindsight the pet fees feel like an official rip-off. However the agriculture guy was pretty clear from the first second that it will cost us. 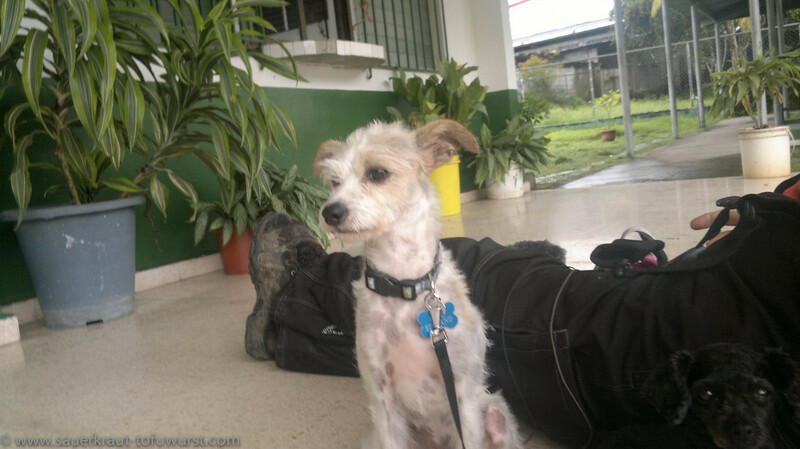 I guess Skippy could have smuggled the dogs somehow into Panama since the shopping mall system is pretty chaotic and I am not sure how the border control is 50meters to your left or right. The biggest hurdle will be the police check point which is about 1km after the border station. If you know your way around that one you might be able to save a lot of money. On the other hand, if you come on a weekend and you think you get through by bribing the officials, remember to stay below 146USD per dog. Of course at this stage I do not know how the export will go but typically nobody cares about dogs when leaving a country. panama was a big rip off my dog leela went threw all that after 4 days of riding around looking for a hotel that she could stay at we left sorry panama you just are a not dog friendly place .